A few weeks ago, my boyfriend, two out-of-town friends and I decided to try Hikaru, just south of South Street in Society Hill. I’m usually very picky about sushi; in fact, I rarely buy it at all. Many years ago, I spent some time studying in Japan and the food was amazing. Unfortunately, most of the Japanese cuisine in America cannot compare to the high quality I received abroad. Still, I was willing to try Hikaru due to the very positive reviews. Also, Hikaru means “Shining One” in Japanese and comes from one of my favorite medieval novels, The Tale of Genji, which is scintillating enough; so, I figured it might be a good place to meet some friends who wanted to try Philly sushi. The atmosphere of Hikaru was interesting. The lighting was low and romantic, typical of most Japanese restaurants. I was delighted to see they had traditional washitsu seating complete with tatami and zabuton. Sadly, my companions expressed their disinterest in sitting “on the floor”, so we selected the English-style seating. The first thing I ask when I try a new Japanese restaurant is if they serve shabu-shabu or not. I figure that they might not have it on the menu, but may serve it anyway for real Japanese food fans. Alas, Hikaru did not have my favorite dish after all, so I opted for the Hell Roll appetizer, and the Tofu Teriyaki complete meal. My companions decided to try the Sashimi Combination Platter, and the Chicken Teriyaki and Beef Teriyaki meal. I have mixed feelings about the dinner at Hikaru. On one hand, the Hell Roll was delicious: a spicy tuna roll without the globular, stinky mayonnaise that is usually plopped on top, for which I was grateful. The spice comes from spicy tobiko (flying fish roe) and a cayenne pepper coating on the outside of the rice. Although not very traditional, the Hell Roll was fantastic; the spice did not overpower the flavor of the raw tuna. The miso soup was perfectly seasoned with white miso paste, seaweed, and tofu. The salad, on the other hand, left much to be desired. The iceberg lettuce, barely a verdant hue, swam languidly in water I presume it was washed in. The tangy ginger dressing would be better paired with a different salad with fresher ingredients. My tofu entree was somewhat better. The tofu was lightly fried, and amazingly flavorful; however, the teriyaki sauce was overly sweet and the accompanying vegetables were skimpy and, for lack of better of better word, sad-looking. I was surprised that Hikaru did not serve vibrant, summer vegetables rather than the bean sprouts and onions that appeared on the hot plate. Real Japanese cooking embraces seasonal ingredients, a philosophy that Hikaru did not seem to employ. Unfortunately, I forgot to snap a photo of my meal, but my boyfriend did get one of his (below right) and our friend’s meal (above left) on his iPhone. My companions seemed to enjoy their own meals, so I refrained from openly complaining about mine. The food was not terribly exciting, aside from the Hell Roll, which was great. Hikaru was filling means to an end. The tofu meal I purchased was overpriced for it’s mediocre taste, roughly priced at 18 dollars for some fried tofu, wilted vegetables, miso soup and rice. Honestly, 10 dollars would be a more appropriate price for such a meal. The wait staff was attentive and willing to converse a little bit in Japanese, a pleasant aspect of the dining experience. Dining near or on South Street usually calls for overpriced food, but this is a moot point. I will travel off the beaten path for an amazing meal, so location is of little importance to me. I am still searching for the perfect, Japanese home-cooked meal. Any suggestions are welcomed! Tags: ginger dressing, miso soup, sashimi, shabu-shabu, Sushi, teriyaki, tofu. Bookmark the permalink. Great article and all, Kate, but what I really want to talk about it the t-shirt in the background of the first picture. I need to get one, where would I do that? Love it! I don’t know, Shannon. That’s someone else’s chest, not mine. It’d be fair to guess she got it at Hot Topic. I’ve yet to find any satisfying, “homestyle” Japanese food anywhere near Philadelphia, sadly. So I mostly stick to making it myself. I remember going to Hikaru many years ago and having about the same experience. Decent sushi (though the standard sushi plate was loaded with the cheap stuff) but everything else lackluster for the price. 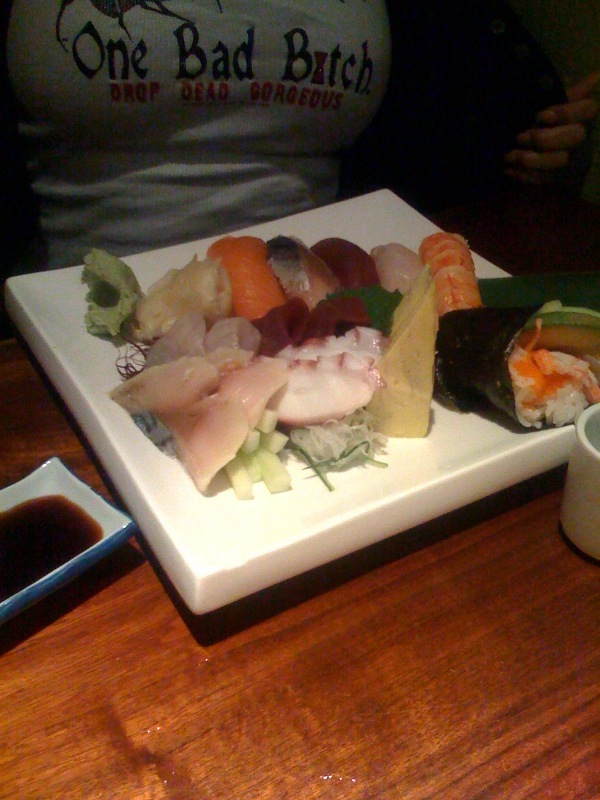 This is actually my favorite sushi place in the city I have tried, for the price at least. And yes, the miso soup is always good. Thank you for the recommendations, Colin. I will try your suggestions the next time I dine at Hikaru. Fresh scallop sashimi is one of life’s most delicious pleasures.